If your idea of kicking up a dish is using salt and pepper, there’s a rich and fabulously varied world of spices waiting to be discovered. Mace, coriander, mustard seed, fennel, saffron, and paprika don’t have to be those scary, untouchables on the supermarket shelf. Cooking with spices can actually be fun, interesting, enjoyable and, most of all, delicious. Using spices will vastly improve your cooking and make you feel, finally, in command of your kitchen. Jenna Holst is the author of Stews, (Hungry Minds, 1998) and Cooking Soups for Dummies, (Hungry Minds, 2001). Her work has been featured in many national magazines, including Food & Wine, Weight Watchers, and Reedbook. She has worked for many years as a food writer, culinary instructor, and consultant. Her clients have included several book publishers as well as PBS and cable television programs. Formerly a resident of New Jersey, she currently lives in South Africa. PART I: Taking the Spice Route. Chapter 1: A Spicy Tale. Chapter 2: The Spice Rack: A Guide to Dried Spices. Chapter 3: Fresh Spices, Aromatics, and Spicy Condiments. 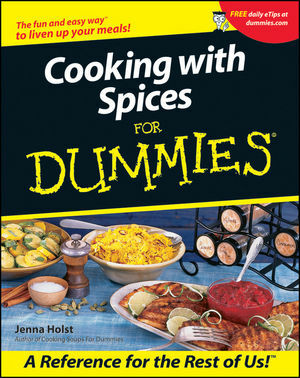 Chapter 4: Spicing Up Your Kitchen. Chapter 6: Make No Mistakes. Chapter 7: Spicy Combos: A Guide to the Use of Spices and Complementary Ingredients. Chapter 8: Spicy Game Plans. PART III: On the Starting Line. Chapter 9: Basic Rubs and Spice Mixes. Chapter 10: Marinades and Sauces. Chapter 11: Salsas and Salads. PART IV: From the Main Course to the Finish Line. Chapter 16: Vegetables and Legumes. Chapter 17: Pasta, Potatoes, and Grains. Chapter 18: Quick Breads and Sweets. Chapter 20: Ten Spicy Presentations. Chapter 21: Ten Spicy Sources. Appendix A: Metric Conversion Guide. Appendix B: Glossary of Cooking Terms. Appendix C: Spice Quantity Guide.